These are some more shots of my Tour to Europe in Sept - Nov 2012. I has been a while since I last saw them.. great to be able to catch up on them at last! Just arrived in Valencia on our Cosmos tour, October 15, 2012. On a tour of the City of Arts and Sciences. It is an entertainment-based cultural and architectural complex in the city of Valencia, Spain. 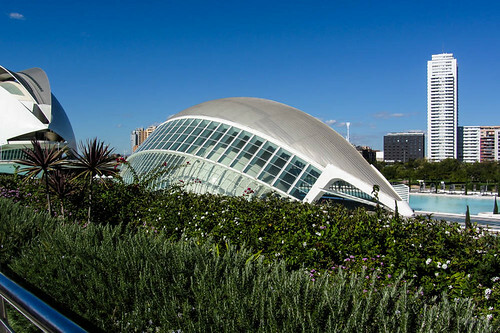 It is the most important modern tourist destination in the city of Valencia. Designed by Santiago Calatrava and Félix Candela, the project underwent the first stages of construction in July 1996 and the finished "city" was inaugurated April 16, 1998 with the opening of L'Hemisfèric. The last great component of the City of Arts and Sciences, El Palau de les Arts Reina Sofia, was presented on October 9, 2005, Valencian Community Day.